Vermaas Marine is a fully independent marine consultancy and surveying company, operating in various branches of the maritime industry. 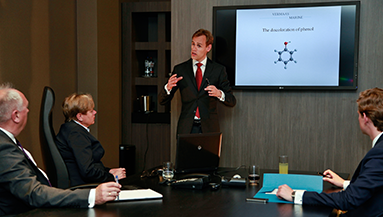 The office is based at Sliedrecht, at close proximity of the Amsterdam, Rotterdam and Antwerp port areas. Our particular expertise is regarding (alleged) cargo damages, disputes and issues which arise in the shipping and transport industry. We advise and offer our services to ship owners and operators, charterers, P&I Clubs and other liability insurers. Our surveyors are specialised in various disciplines. Depending on the nature of the (alleged) damage or dispute a surveyor with the appropriate discipline and experience is selected. As a result we are able to provide tailor-made top quality services. We have extensive knowledge and experience in both the nautical and scientific field. Our nautical surveyor and also managing director has nearly ten years of experience as deck officer in the Dutch merchant navy. He served on various types of ships and has more than 25 years of experience in the marine consultancy and survey business. We bring a team of nautical and scientific experts together in matters that need a multidisciplinary approach. This unique concept guarantees that a tailor-made strategy is followed to bring matters to the right conclusion.